The wrote the TALMUD 200ad and 700ad, then it bacame the Religion of the Karzanians who later become the ZIONIST the Crypto Jews=Zionsit started the JESUITS in 1526, the TaLMUD says Jesus Mother was a Whore, I suspect the Jesuits use the TALMUD in Secret with the Zionist and the Protestants that have been Infiltrated it is connected to Bizare Rituals, even baby sacrafice, see on youtube Cathy O'Brian. The term "Jewish" comes from the word "Yehudi". A "Yehudi" was a member of the tribe of "Yehuda" or "Judah". "Judah", was one of the twelve sons of Jacob. When ten of the twelve tribes of Jacob (Israel) were carried away after a foreign invasion, the tribes of Judah,Benjamin and Levi were left alone. Since Judah was the larger of the three tribes, eventually, over time, as the tribes intermarried, all three tribes blended into one.Levi was somewhat of an exception as they maintain a seperate identity to this day. In fact, there are two divisions within the tribe of Levi. Levi and Kohain.Kohains are the decendents of one particular Levite- Aaron, the brother of Moses. The captured tribes are known as the "Lost Tribes". Some traditions say that they perished. Some traditions,however maintain that the descendants of the lost tribes remained identified with their heritage and somehow survived the ages, though somewhat morphed by time and traditions. This is as far-fetched as it is plausible. It is well known that "Jews" have shown themselves capable of maintaining hidden dual identities. It would not have been economical for any invader to kill off their captives. Captive slaves were the finest booty. Perhaps the older captives both male and female were killed off. But the younger woman and children should have been considered prizes to any conquering nation. The captors, however, had no idea of the secret resolve of their captives- to maintain their identities. There are some who say that the various nations of Europe are the descendants of the "lost tribes". Considering the nature and history of the "Jewish" people...this is plausible. I would be hard-pressed to dismiss the idea out-of-hand. Though denied the Five Books of Moses, cells of the remnants captives would still be able to cling to the Noachide code. Those that were separated from their "Israelite" traditions and teachings would have been able to live their lives according to the noble and mystical Noachide traditions. After all, those ancient teachings preceded the exodus from Egypt. I would not be surprised if Freemasonry was founded to unite the members of the lost tribes scattered throughout Europe.A brotherhood united upon principles and teachings based on the ancient traditions which pre-date Sinai. 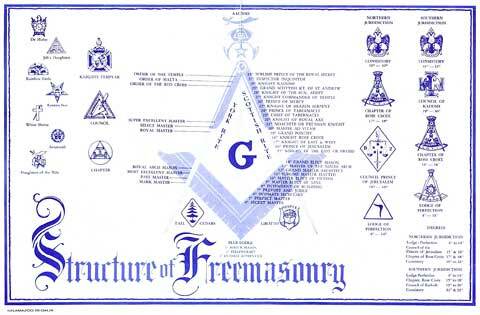 The Masonic movement was indeed based on the ancient Noachide Code. The Code promoted as laws fit for mankind. Freemasonry was established in England in 1717 (Two hundred years after the Spanish expulsion.Less than 4o years after Jews were officially permitted back into England by Oliver Cromwell). Were the original Guilds of Masons infiltrated by crypto-Jews for the purpose of re-uniting all the remnants of the tribes of Israel-both overt and covert? Suffice it to say that the "Jews" to watch.... may not always appear to be "Jewish". In fact, the people that you would least expect to be Jewish, may very well be. A people capable of blending in over time yet still maintain a hidden allegiance cannot be watched. They are invisible. This knowledge was not lost on a man who claimed to be the Jewish Messiah, Sabbatai Zvi. About the same time in history as the establishment of Freemasonry, he and his followers gained considerable strength when they went underground. Did his followers infiltrate Freemasonry? Are his followers those that are referred to as the Illuminati? Rome, Italy, Mar 3, 2010 / 04:20 pm (CNA).- A renowned exorcist in Rome recently released a book of memoirs in which he declares to know of the existence of Satanic sects in the Vatican where participation reaches all the way to the College of Cardinals. A second demonologist, also residing in Rome, entered the debate this week, clarifying the origins of the information and defending the Vatican's clergy as an "edifying and virtuous" collection of prelates. In a book of memoirs released in February, the noted Italian exorcist Fr. Gabriele Amorth affirmed that "Yes, also in the Vatican there are members of Satanic sects." When asked if members of the clergy are involved or if this is within the lay community, he responded, "There are priests, monsignors and also cardinals!" The book, "Father Amorth. Memoirs of an Exorcist. My life fighting against Satan." was written by Marco Tosatti, who compiled it from interviews with the priest. Fr. Amorth was asked by Tosatti how he knows Vatican clergy are involved. He answered, "I know from those who have been able to relate it to me because they had a way of knowing directly. And it's something 'confessed' most times by the very demon under obedience during the exorcisms." The famous Italian exorcist was also asked if the Pope was aware of Satanic sects in the Vatican, to which Fr. Amorth replied, "Of course, he was informed. But he does what he can. It's a horrifying thing." Benedict XVI, being German, comes from a place "decidedly averse to these things," argued Fr. Amorth, saying that in Germany "there practically aren't any exorcists." However, he clarified, "the Pope believes (in them)." The Italian priest also warned of the existence of bishops and priests who do not believe in Satan in the interview. "And yet, in the Gospel, Jesus speaks extensively about it, so it should be said, either they've never read the Gospel or they just don't believe it!" Fr. Jose Antonio Fortea Cucurull, a Spanish priest and theologian who specializes in demonology and is now studying for his doctorate of theology in Rome, responded to Fr. Amorth's assertions on March 1. After reading reports of Fr. Amorth's accusations pointing a finger at members of the clergy, including cardinals, Fr. Fortea declared that it is a "duty of justice" to speak out in their defense. Noting that some prelates "are more spiritual and others more earthly, some more virtuous and others more human," he wrote on his blog, "from there to affirm that some cardinals are members of Satanic sects is an unacceptable distance." The Spanish priest then explained the sources of information used by Fr. Amorth to say that Satanic sects are operating in the Vatican. In addition to the people that seek help for demonic possession, said Fr. Fortea, "innumerable persons come to us who claim to have visions, revelations and messages from Our Lord." Among these, "a certain number offer apocalyptic messages and revelations about the infiltration of Satanism and the Masons within the dome of the Church." Fr. Fortea added that the only acceptable stance is to suspend judgment of the messages while they are subjected to time-intensive discernment, "sometimes months for each one of the cases." The other source Fr. Amorth refers to, according to Fr. Fortea, is the demons who are being exorcised. Of this, the Spanish priest wrote that knowing whether or not the demon is telling the truth "is in many cases impossible." "We can know with great confidence when a demon tells the truth in the subject directly related with the exorcism. That is, the number of demons, their name and similar things. But we cannot be confident in what regards concrete news relating to people." "Father Amorth does not have other sources of knowledge than the two that I just cited," indicated the Spanish exorcist, "I refer to his own words for this affirmation." Fr. Fortea observed that the existence of similar messages from the same sources is "something known by me just as (it has been) by many other colleagues for many years." "Among exorcists, some have come to similar conclusions as those of Fr. Amorth. Others have not." Fr. Fortea also defended those implicated in Fr. Amorth's statements, stating, "Our College of Cardinals, if we compare it with past centuries is the most edifying and virtuous that history has ever known. One would have to go back to the epoch of the Roman Empire to find a body of electors so distanced from all earthly pretension as the current one is. "Cardinals might be better or worse," he reflected, "but all have upright intentions and seek the glory of God." He concluded by emphasizing, "Statements must be proven, especially when they are about such grave accusations that affect the honorability of those who form part of the Head of the Church as far as they help the Supreme Pastor." We Jesuits take pleasure in admitting those of Jewish ancestry. Many people love to point the finger at the Jesuits as the cause of the world's troubles. The Jesuit order is a Roman Catholic order of priests and scholars. Their leadership live in the Vatican. The great secret however is that the society of Jesus was organized by crypto-Jews. The Jesuit society was created in 1534 by a group of Marrano Jews: Ignatius Loyola, Alfonso Salmeron and Diego Lainez. In 1492 the entire Jewish community of Spain, some 200 000 of them, were expelled. Amidst these expulsions the tactic of crypto-Judaism is taken up by many in the Jewish community in order to hide and evade exile and persecution. But the conversion is always a dishonest one and they continue their Jewish practices in secret. The founder of the Jesuit order Ignatius Loyola himself was a crypto-Jew of the occult cabala. In 1491 Loyola began his subversive activities in the Jewish Illuminati order of Spain under the guise of Roman Catholicism. and persecuting order in the Roman Catholic Church." Still, many of the Jews who were expelled from Spain headed over to Africa and began selling slaves to south American colonies of the Portuguese and Spanish empires. This later flourished into the full out trans-Atlantic slave trade where some 99 million Africans perished. On top of their Jewish roots, the Jesuits have always behaved similarly to the perfidious Jewish elite. Like the Jews, the Jesuits have been expelled from many nations. By the 18th century the society had acquired a reputation in Europe for political maneuvering and economic exploitation. The common conception was that the Jesuits were greedy plotters who would constantly meddle in state affairs through their ties with influential members of the Royal Court in order to further their own interests. Who does this remind you of? Take into consideration the Jesuit order's Jewish origins and how the general historical behavior of Jesuits is completely mimetic to that of Jews. Could it be that they are one in the same? You decide. "The Illuminati﻿ Order was preceded in the 1500's in Spain by the "Alumbrados," a Christian heresy started by crypto Jews called "Marranos." The founder of the Jesuit Order, Ignatius of Loyola, was a Marrano/Alumbrado. Thus when people today argue whether it is the Jesuits or Zionists﻿ who are responsible for our troubles, they are really talking about the same beast. "-David Livingstone, author of "Terrorism and the Illuminati"